Imperforate, handmade paper, watermark KKHM or no watermark, typography. Printed by Kaiserliche Köningliche Hof- und Staatsdrückerei. These stamps were invalidated as of December 31, 1858. 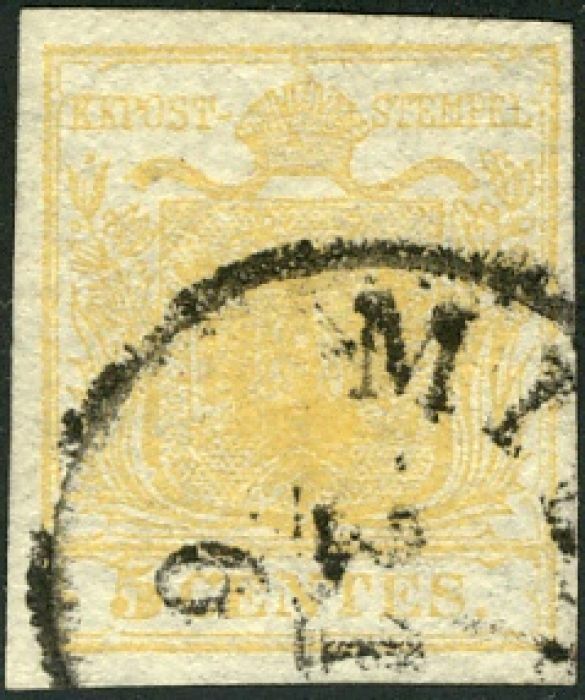 Austria simultaneously with its own #1 issued a stamp for northern Italy, which was then part of the Austrian empire, but was gradually annexed to Italian states over following decades. Much more information is available in both Italian and English on the First issue of the Lombardy-Venetia stamps and at Antichi Stati Italiani.